You are here: Home / Green / LittleEcoFootprint: Unboxing the April Baby Box, Full of Natural and Organic Goodies for Baby & Yummy Treats for Mom! 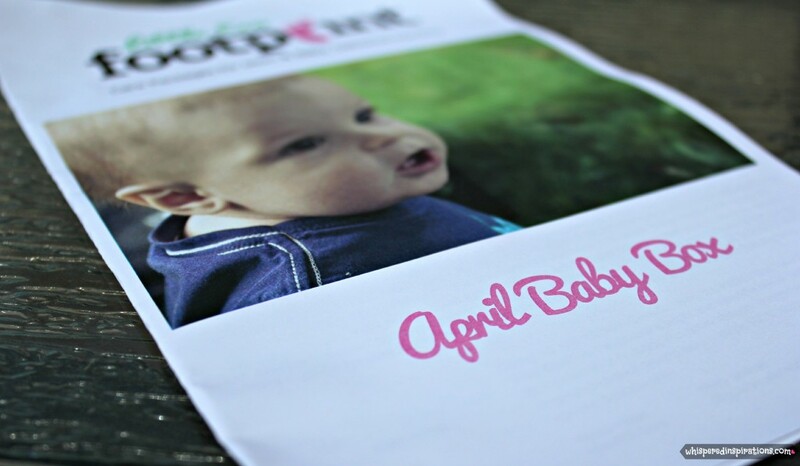 LittleEcoFootprint: Unboxing the April Baby Box, Full of Natural and Organic Goodies for Baby & Yummy Treats for Mom! LittleEcoFootprint and The April Baby Box! This month’s box was with no doubt, filled with goodies as always! It was super exciting to receive lots of things for myself and Mimi, of course! I am always amazed by the value you get from this baby box subscription because you get a lot of bang for your buck. A few things for Momma! Earth Berries are definitely interesting but, an effective way to wash your clothes. All you have to do is place 5 whole or 10 half Earth’s Berries soap nut husks in the cotton bag that comes in the package and tie the bag closed. Place it in a small cup of hot water to activate and the place it into your washer. Soap nuts are one of the most economical and environmentally friendly ways of doing laundry and cleaning. They will leave your clothes soft, scent free, residue free without the need for fabric softener. You can even make liquid soap from these soap nuts, check it out, here. I think this Moroccan Argan Oil is one of the most versatile products that we have received yet! ELMA&SANA is a direct retailer of Argan Oil, too! For Hair – Apply to hair any time or after shampoo as a leave-in treatment or use as pre-wash treatment applying it 30 minutes before shampooing – massage scalp and brush through hair will give added benefits. 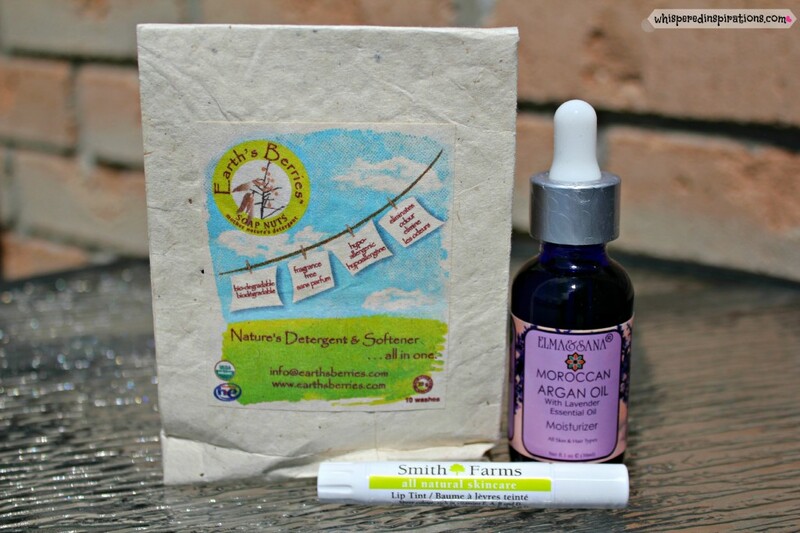 Smith Farms– All Natural Skincare! 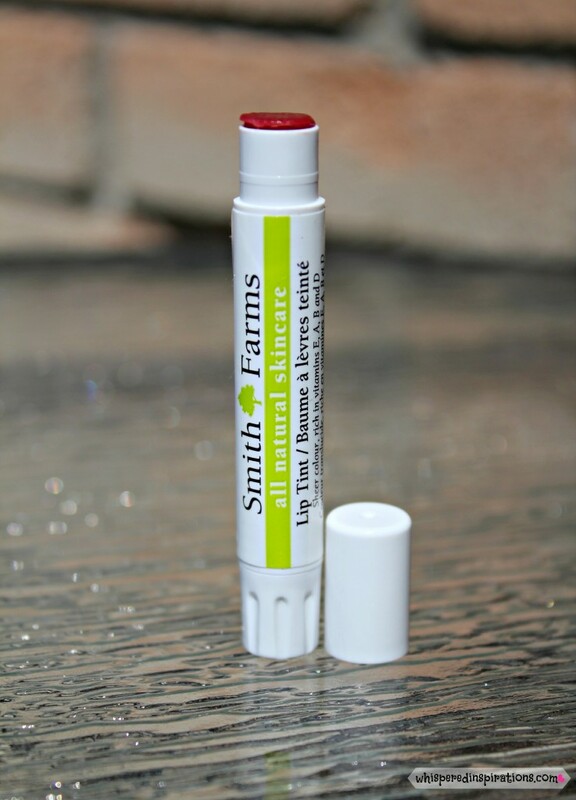 This was my most favorite thing in the box this month, organic and natural lip tint is my go-to for EVERYDAY use. It went on smooth and left a beautiful shine. Don’t be fooled by the dark color because it goes on and leaves a very natural, healthy hue that pretty much enhances your natural lip color. It also has a hint of an orange aroma! This lip tint retails for $6.99 and I say, it’s totally worth it! I don’t know what it is about these blocks that Mimi totally falls in love with. 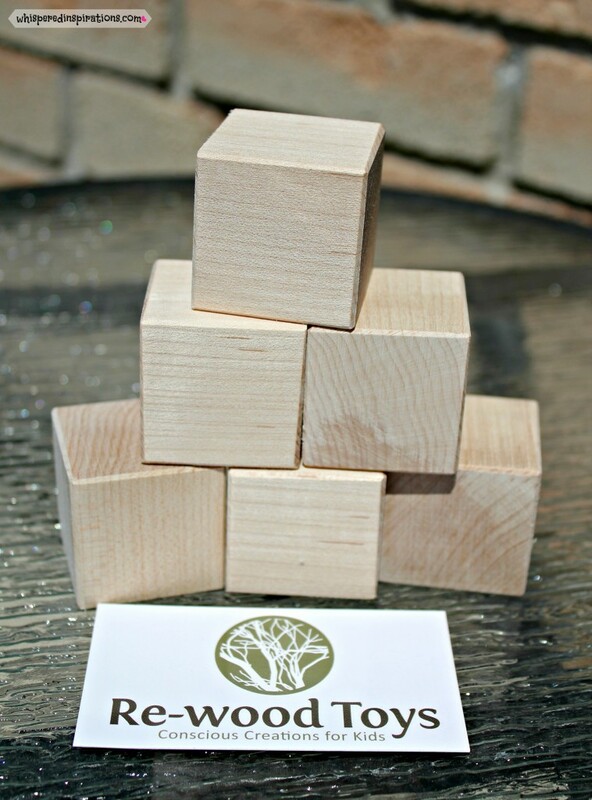 Perhaps, it’s the simplicity of them that allows her mind and imagination to ignite or kids just really love blocks. But, I know as soon as she saw them she began to stack them, build “buildings’ and use them with her other toys. I don’t think a day has gone by that she hasn’t played with these blocks! Re-wood Toys also make rattles, blocks, stacking toys and teethers – each one is safe, natural and non toxic! These blocks retail for about $8.00. 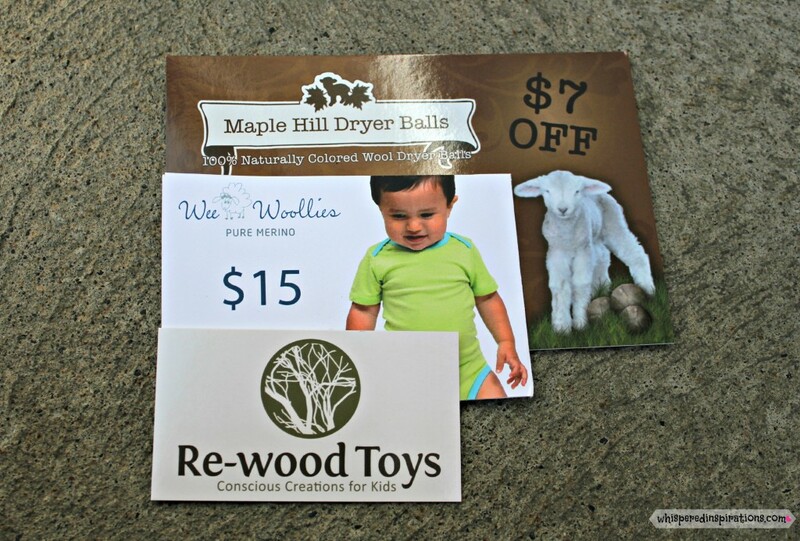 Also included in April’s Baby Box was a $7.00 off of Maple Hill Dryer Balls for naturally colored wool dryer balls and a $15.00 Wee Woolies Pure Herino Gift Card to use towards purchasing the fabulous products. The Maple HIll Dryer Balls Wool Dryer Balls are naturally colored with no dyes added and will decrease static cling while fluffing up clothing without using a conventional dryer sheet that is full of harmful chemicals. Wee Woolies has adorable clothes and sleepwear for newborns to 6 years. They are bright and vibrant and soft and comfy for that precious baby skin! They are made in Canada using the world’s best New Zealand merino! 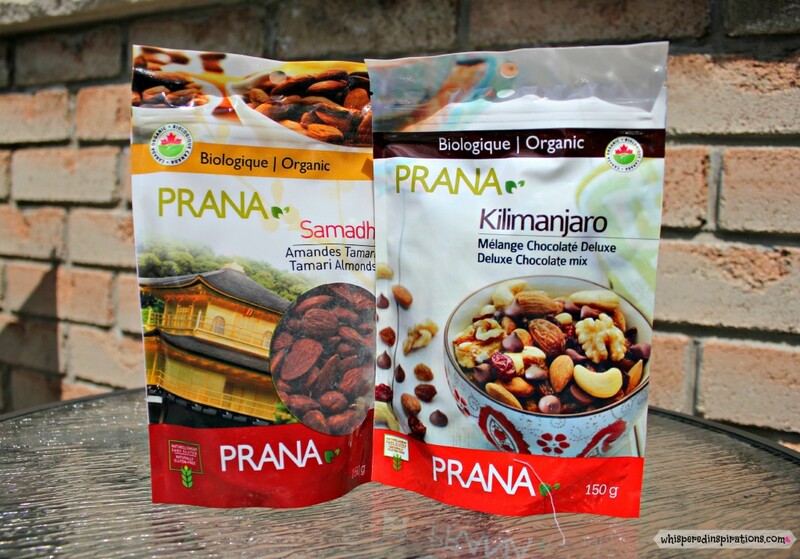 Now this was a pleasant surprise to find in our box, I absolutely love PRANA and the Kilimanjaro Trail Mix was soooo good! Let’s just say that it didn’t last in our house very long and the Samadhi Almonds, not so much either! Mimi and Gabby both loved the mix as well, Gabby loved the cashews and Mimi loved the cranberries. 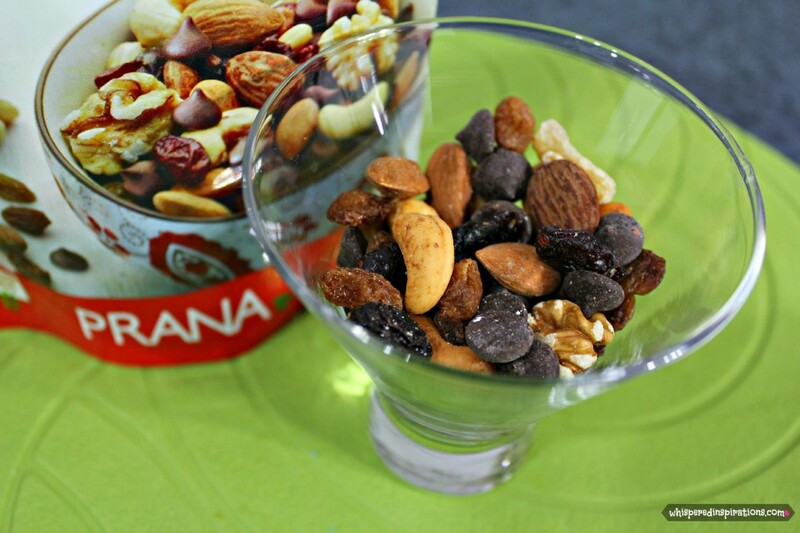 I loved seeing the girls excited for healthy snacks and they thoroughly enjoyed PRANA. What I loved about the Kilimanjaro Trail Mix was the delicious mix of the nuts and the tartness of the cranberries and the DARK CHOCOLATE of course! These bags retail for $5.00/each and that, my friends, is worth the heaven in your mouth and the health benefits reaped. You can’t go wrong with Canadian-made and organic. There you have it folks, that was the April Baby Box! I wonder what is to come for the May Baby Box that is shipping very soon! Remember, you can sign up for LittleEcoFootPrint to get your box of goodies every month for only $29/month! Which product would you most like to try from the April Box? What a fabulous idea! As a Mom, I would love something like this for sure!!! I love how you get samples of so many products! It introduces you to new things that you would never normally pick up yourself! I would love to try the Earth Berries. I have heard so much about those lately! The Earth Berries are super cool, I love products that are good for you! Oh, wow! This is such an amazing idea! How have I not heard of this before?! Thanks for sharing with us. I'm going to the website now to check it out! I really want to try that lip balm. Thanks for sharing. This seems like an awesome company. It\’s lovely, I love it! Great review! We were super happy with our April box too. They just keep getting better & better! All that for only $29!? That is a deal, especially because the nuts alone were a $10 value. My kids would love the re-wood blocks as well. Great pictures. Thanks for sharing. I am definitely going to gift a subscription to a good friend of mine who is expecting her first in two months. She'd love this! Yes, it\’s a great service.